Image Size: 14.5 X 24 in. For over a year, artist James C. Christensen painted “under the guise” of an obscure, 15th century Flemish painter, best known for, and named after, a multi-paneled masterpiece called The Enoch Altarpiece. Also known as Jehovah Teaches Enoch the Plan of Salvation, what remains of The Enoch Altarpiece are the two sides that once flanked the (missing) center panel. The two angels, who originally were positioned to bless the center scene, incorporate symbols of God’s original plan for man’s salvation. With the angel on the left are fruit and a serpent, representing the Garden of Eden and the fall of man, while a skull pierced by an Easter Lily appears with the angel on the right, suggesting the triumph of Christ over death and the redemption of man. 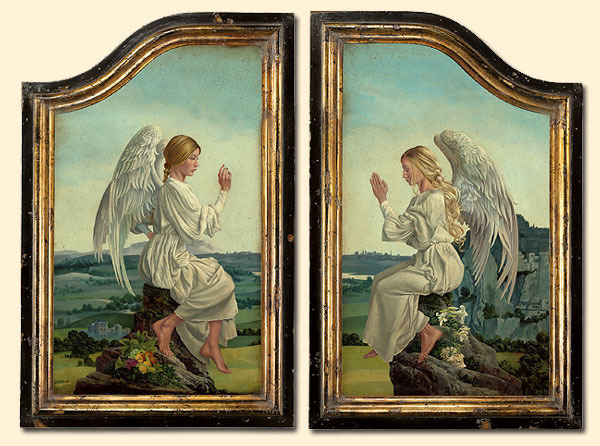 The Enoch Altarpiece is a framed, two-piece canvas print set. The artisan who created the frames for the original paintings was commissioned by Greenwich to create two prototypes for this limited edition print set. The elegant resin-molded frames are distressed and hand-brushed with gold to recreate the look of 15th century art treasures.